Can anyone recommend 3D glasses that can be used on Epson EH-TW5600 Video Projectors? Fairly stylish they are too! By the way David I ordered them almost a month ago, they should be here soon, as there seems to be a shortage at the moment. If you get any of the STAR WARS films in 3-D , let us know how well they projected . Well David I don't have any Star Wars on 3D and to be honest the only one I might consider later on would be "Rogue One" as I enjoyed the 2D version of that one. The later Star Wars movies like Solo don't really impress me. However the Epson glasses did arrive two days ago, and after charging I tried my first ever 3D Blu-disc "Jurassic World". The Blu-ray player is a Pioneer BDP-180 and can play all Region "B" Blu-ray discs. The big plus with this player and to my surprise, it is Region Free for all DVDs Pal/NTSC and will play anything DVD wise. So the moment of truth...The Epson projector picked up the 3D signal automatically, and after a few seconds after switching on the glasses we went straight to 3D. I found there was no need for pressing the little button on the glasses for pairing with the projector, it was not required. Today it was time to sit down and try "Terminator 2" on 3D. This was truly amazing to watch, once again the image, the color, the detail, how did they get it to look so good? The glasses worked perfect as did the projector. I noticed during the night time scenes, if I slipped the glasses off for a second the screen looked very bright indeed, but when I put them back on, the night sky was a "perfect black" as it should be. The calibration between the Epson glasses and the Epson projector is spot on in every way. Although the Epson glasses were expensive I am glad I went that road and not a cheaper alternative. WOW !! HOW AWESOME ! I'd LOVE to see T2 in 3-D . They don't offer that one here in the states for our region players. Looks like you got a real nice toy !! I am surprised T2 in 3D is not available in the US. That's a pity, as it is very good on Blu-ray. In the past I have been disappointed watching older films that were not made for 3D that were converted, such as the first "Jurassic Park" and the Disney animated 1991 "Beauty and the Beast" That one in particular had the look of flat carboard cut-outs moving around in front of the background. After that I decided that unless the movie was indeed made for 3D and not converted I would not bother going to the cinema. Watching "T2" has shown me that with the technology as it is now. Its possible to get very good results in 3D out of films that were not made for it. IT CAME FROM OUTER SPACE in 3D is one of my favorite 3D movies. The Bubble, although not a great movie has a great scene of a tray of bear that literally comes out of the screen so far you can reach out and grab some. Amityville 3D has a scene where a pipe seems like it will poke your eye out but you have to buy all three movies. Wait to get Creatue and Revenge as they work out the rendering problem on the Revenge disc. I never be a fan of 3D movie. Any 3D method have been tried and I could sit for only a minute or two. It is not because of the movie looked bad but I got dizzy always. I don't know with this new technology, will I be sitting longer or just the same. O btw... I am a man with myopia eyes. I agree 3D is not for everyone, but if it does work, then its pretty impressive. The Epson has been getting a bit of 3D use and it certainly draws you in. I was surprised how good "Jurassic Park" looked, considering it was never made in 3D. When I watched the 3D release at the cinema a few years back I was disappointed, but the Blu-ray 3D of this film was very well done. Others which have worked out well and in particular was the 2016 movie "Passengers" but the one that surprised me the most, was the "The Wizard Of OZ" 1939. From the opening black and white scenes, right through the movie this 3D conversion really looked fantastic I was at a total loss as to how they have managed to do it. It was not that long ago where home entertainment was a small B/W TV that needed a whack to make the thing go. Three years or so ago my daughter (living in Spain) got me free tickets to see 'Wizard of Oz' showing as part of the film festival in Sitges. It was almost the only title in English. Now I love 'Wizard' but in 3D? Wasn't expecting much. However, my wife and I were impressed. It was funny seeing children playing games in the aisle and even funnier going to the most antequated toilets in existence with the lights going out half way through. 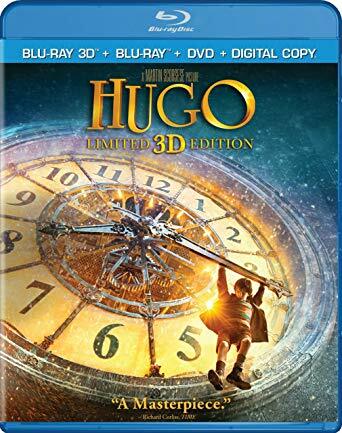 'Hugo' is worth seeing, Graham, and Disney's 'Christmas Carol' is a must for this time of year. 3D well done is fantastic but a duff film in 3D is still duff and probably worse in 2D. I've got two discs coming for Christmas that I'm not supposed to know about but it's amazing what you come across when you're looking for something else! Love 3D Here are my cut down bleach boxes then covered in artwork to store them all. That big drawback with Blu Ray - they won't stand upright on a shelf! I've been totally into LCD projection for a lot of years now as many know - I used to love my 16mm. I too have been extremely impressed with the 3D quality on my Epson LCD HD 3D projector. The glasses system used - whilst not inexpensive, is absolutley stunning in effect...just watched Avengers Infinity Wars in 3D and it looked amazing 8 ft wide. I agree also on the Wizard of Oz £D adaptation. I was also impressed with the conversion of James Cameron's "Titanic" very effective on the big/home screen in 3D. 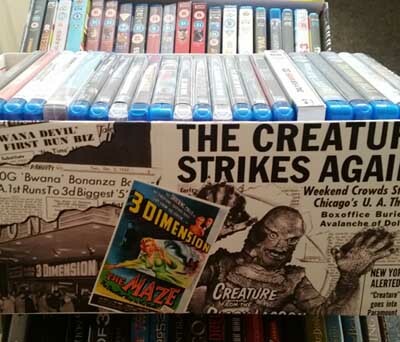 Yes 3D has had its second coming or perhaps its 5th again which has been fabulous particularly with so many of the 1950's REEL 3D films getting the once over to Blu-Ray and another 4 on the way in 2019. 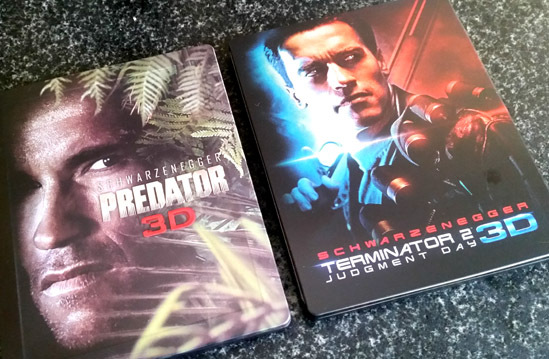 As far as the greatest 3D conversions I will have to go with T23D and Predator 3D both of which looked amazing at the local Odeon and later at home on the old 8ft screen. Although being a cine crank since the 60's real film will always come first here especially for the creative joy of Super 8 film making although I do enjoy shooting 3D with the digital camcorder. Its all a labour of love tho but we still love projecting Terminator 2 on the old GS1200 steam box with its Laserdisc Stereo sound track I dubbed years ago from the old Pioneer. Last night I watched "Ghosts of the Abyss" and I must say looking at wreck of Titanic in 3D is very impressive and as such highly recommend it. I too totally dislike 3D images in and out of the cinemas. To issue 'Wizard Of Oz' in 3D is sheer heresy and a disgrace to an already classic and wonderful looking Technicolor movie. I am at the moment gathering piles of wood in order to burn those blasphemers at the stake if i ever catch them. David have you tried it? 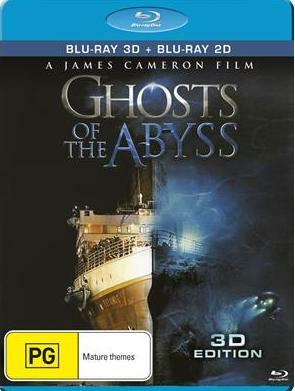 I shall certainly place "Ghosts of the Abyss" on my to buy list. I absolutely agree that some of these "conversions" have really impressed me - "Titanic" 8ft wide and in 3D is quite stunning. I do understand purists, etc but as most who know me are very much aware that is is all about "Big Screen" entertainment for me. I have all the Marvel and DC superhero franchise on 3D (as well as the 2D counterpart) all are excellent and I find that most of the new releases use 3D in a much more subtle and less in your face way as was much the case years ago. Graham, Avatar is stunning in 3D if you haven't seen it yet and I would absolutely love to see how Jaws would come out in a conversion. And just to throw the cat among the pigeons I would love to see something like "Singing in the Rain" or another big screen musical being converted. Of course not to replace the original but to compliment it in terms of viewing experience. Best to all and happy "big screen" viewings. And just to make your day David here are a very small part of my own 3D collection These have given us hours of pleasure and also visiting friends. Following in my late fathers fascination with 3D I'm also a great enthusiast for it particularly as many of the 'golden era' films have been totally restored and available to watch again in real 3D. We still supplement our 3D BR shows with film as well so 8mm 16 and 9.5 are never far away. The Gill Man doc is worth getting if you have never seen it. Not 3D. All these golden era releases are thanks to the very hard work of the American enthusiasts and we owe them much. I’d like to see the Hitchcock DIAL M FOR MURDER in 3D.